They had possessed their tortured souls for so long, ravaging their bodies, rendering them helpless by their dark, supernatural power. Turning them into ghosts, they caused the men to haunt the tombs. No set of chains or ropes would keep these men bound as long as they kept control. It took real, true light to make the dark shudder. As Jesus neared, they knew who it was that was appearing. 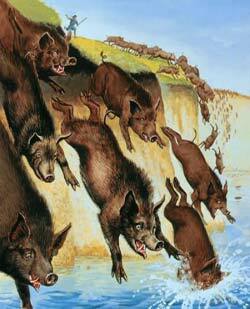 They knew better than the residents of the city and the pig-herders who wondered what was about to happen. Know thy enemy. The demons knew all too well. All they could do was beg. "See us out and we will depart from them." They came as one man, wanting to know who it was that had taken out an important economic resource. All of the pigs slept in a watery grave. As they arrived, they saw the two men they had known to avoid for so long, who had terrorized all who dared to pass by. Yet this time, they were different; tired, weary, slightly confused, but entirely of their own mind. The residents did not pause for long to wonder about them but continued straight for Jesus. They were angry at their loss. All they could do was beg. "See yourself out and depart from us." How much is one life worth? 1000 pigs? 100 pigs? 10 pigs? 1 pig? How much would two be? Two men who hadn't experienced a clear thought for years were now coherent. And yet people were more concerned about saving their own bacon. The locals demonstrated that the price paid for the rescue of these two men was way too steep. Little did they know that the man who cast these demons into the pigs would demonstrate that the cost for these two was a pittance compared to the price he would have to pay for all who God would call His own. Our Lord bore our sin, guilt, and shame, receiving the full brunt of the wrath of God. The Son of God would only know the darkness of death as God's voice went silent as He hung on the cross. For the redemption of all who would come to believe, Jesus died. What does it cost to save a sinner's soul? The perfect life and the substitutionary death of the Son of God. What does it cost for you to love the unlovable?